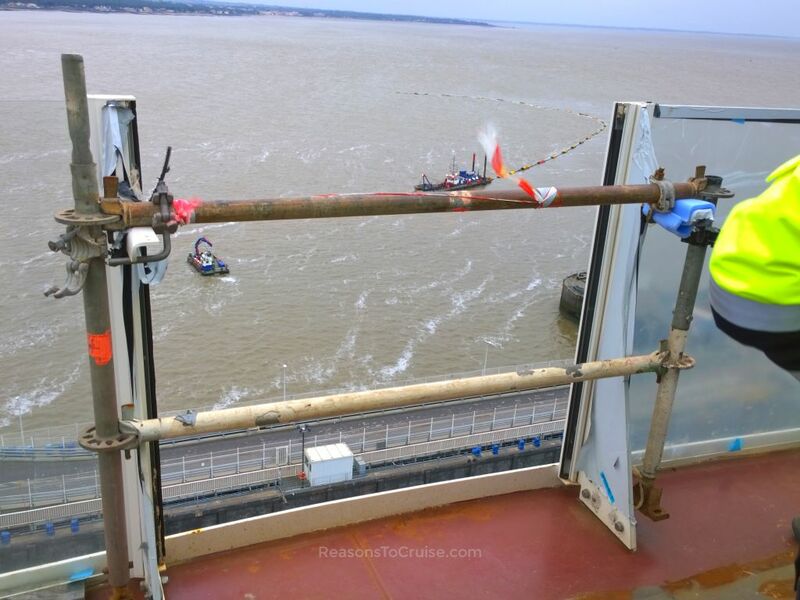 I headed to the STX Europe shipyard in Saint-Nazaire, France to see the latest construction progress of Harmony of the Seas. This trip was my first time at a shipyard, and the experience was mind-blowing. The site was massive, with the shipyard seemingly dominating the town's footprint. Not only is the site extensive but so too is the workforce. An army of workers perhaps doesn't adequately describe just how many people work there. Shifts run between 5 am and 11 pm, and with a busy order book there's no shortage of work to be found. The visit began with a press conference held by representatives from the cruise line and shipyard. Here STX described Royal Caribbean as "a demanding customer" while Royal Caribbean explained how it was striving to create the most exciting ship. A detailed explanation of how Harmony of the Seas will be 20% more efficient than her sisters, Oasis of the Seas and Allure of the Seas, followed. Rapid technological advancements in the last decade meant that some of the technology found on those ships is now obsolete. 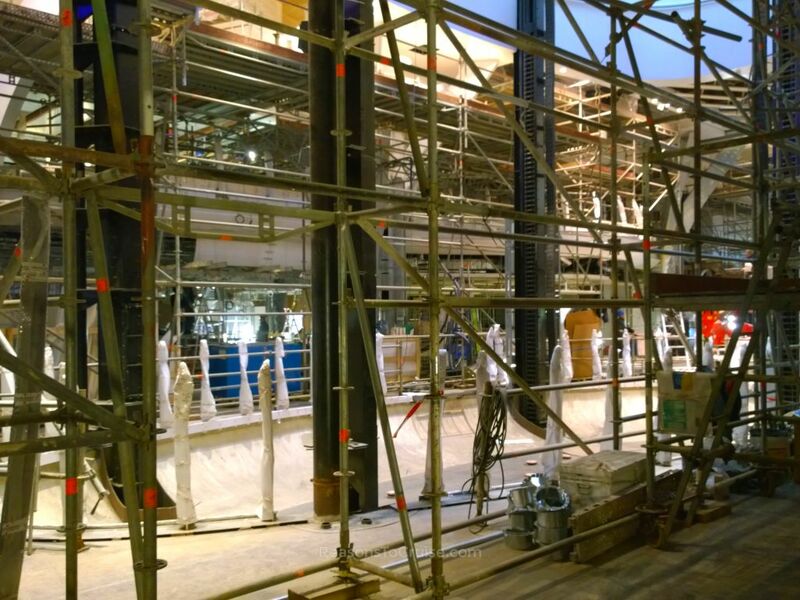 Harmony of the Seas will take advantage of the most efficient engines to date, a new propulsion system, better heat recovery systems, efficient LED lighting, and will boast smart monitors to cut energy usage. A new hull design will streamline the 227,000 gross tonne ship and the air lubrication technology will help reduce drag, increase speed and improve efficiency. The innovative system works by creating microscopic bubbles all over the hull. Celebrity Reflection was the first ship that received this technology, followed by the Quantum-class ships. 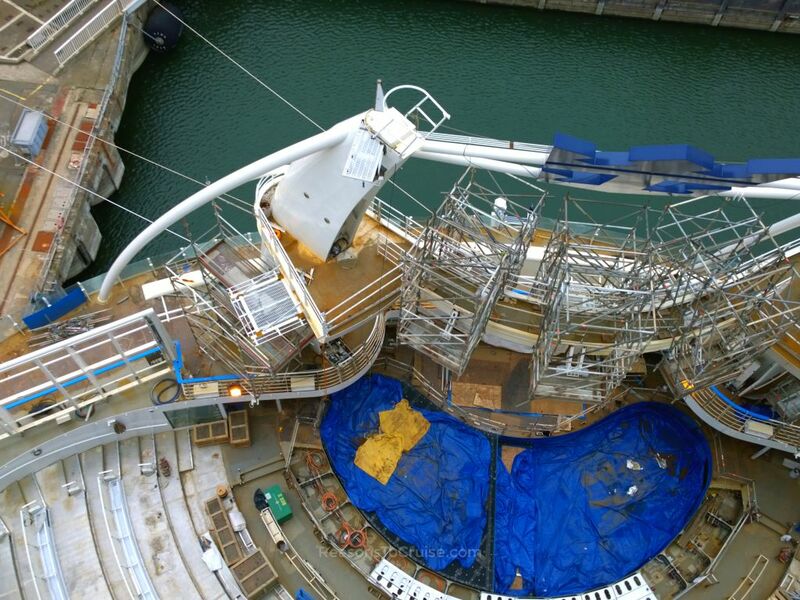 The ship is a construction site, with a lot of work left to do. However, the finished product has started to shine through. Most of the public spaces have been framed and are awaiting cosmetic touches. Some areas are nearly complete whereas others have a bit further to go. 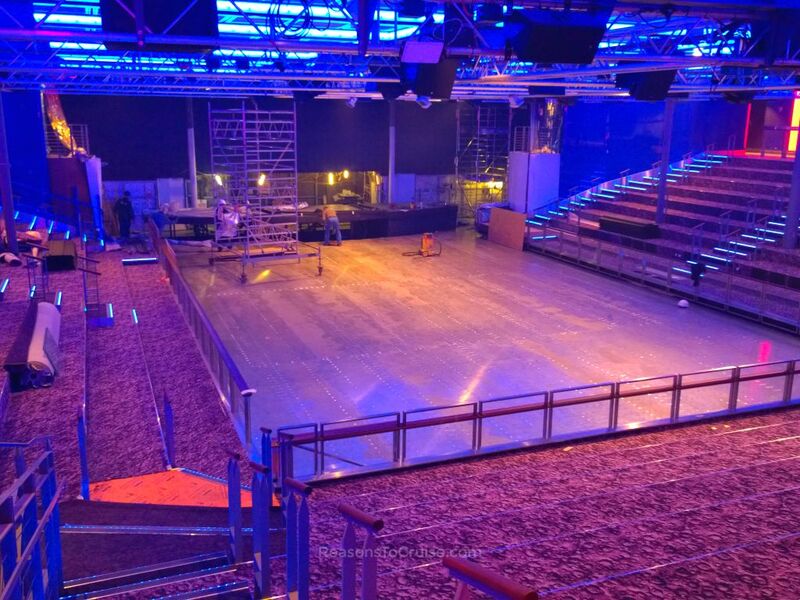 Studio B, home to the ice rink, was almost complete, with seats missing and perhaps the odd finishing touch here and there. 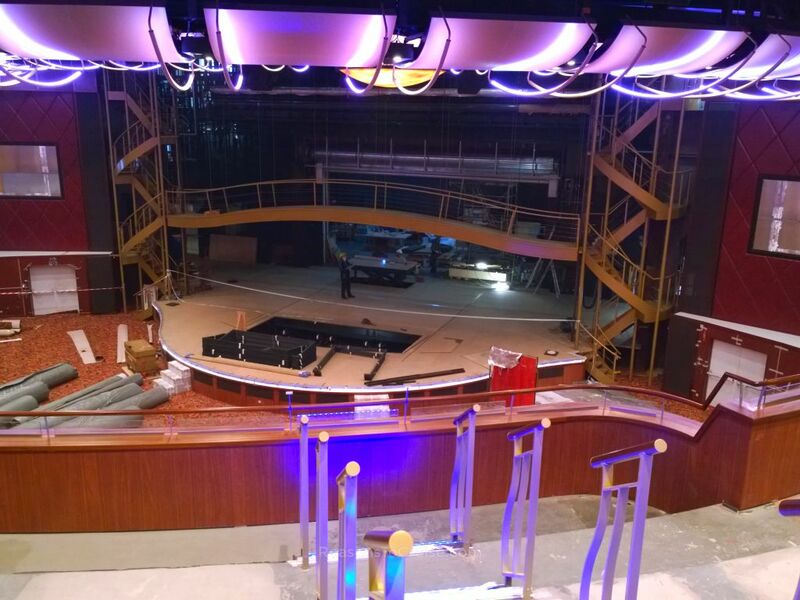 Nick Weir, Vice President of Entertainment for Royal Caribbean International, revealed that some of the technology from the innovative Two70 space on Quantum-class ships would be installed in Studio B to enhance the ice shows. 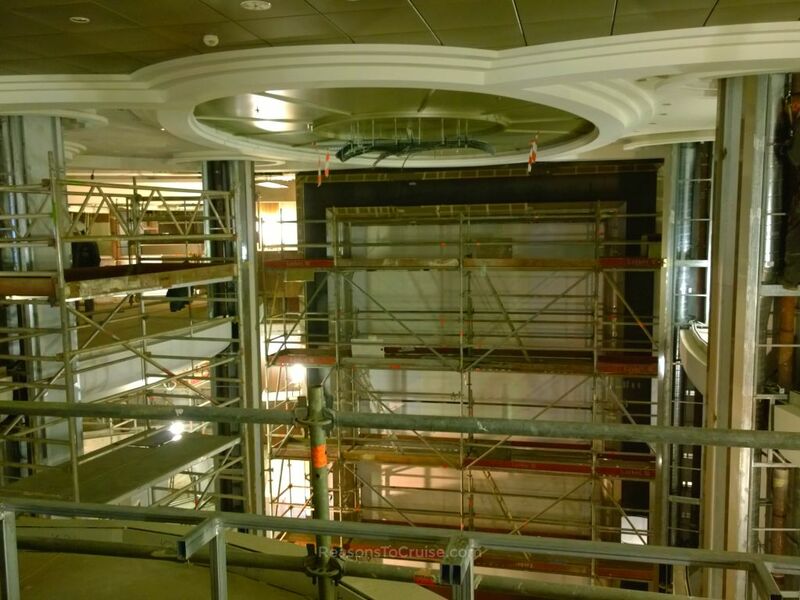 The three-storey main dining room still has lots of work left to do. Even so, the work completed so far bares a resemblance to the traditional multi-deck dining room found on most Royal Caribbean ships. The theatre looked like it was not too far away from completion. It too lacked its seating. Royal Promenade was recognisable, with shops framed out. Like the dining room, most of these spaces still had a way to go. The outline of the Rising Tide bar was beyond the scaffolding. Directly opposite the bar was the space where the quirky robotic bartenders, Bionic Bar by Makr Shakr, will be installed. The robot bar is another addition borrowed from Quantum-class ships and has clearly proved to be a hit on both Quantum of the Seas and Anthem of the Seas. 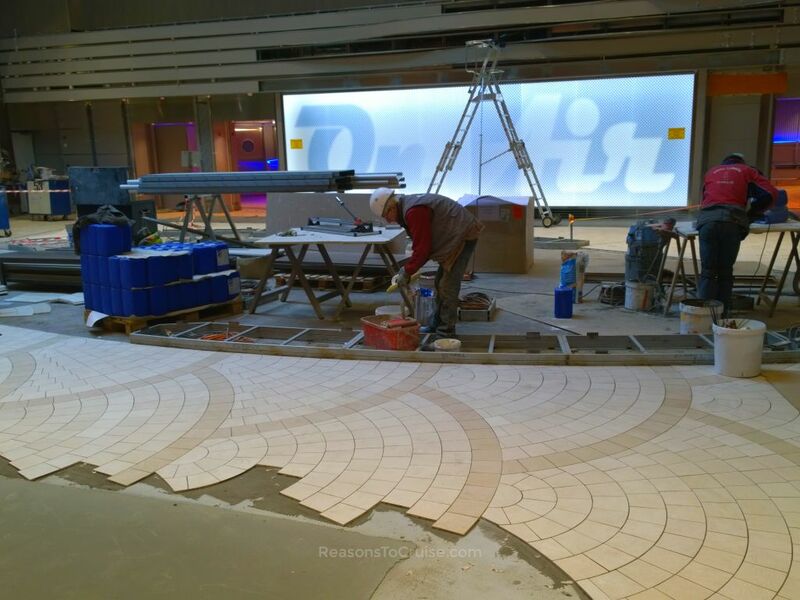 Some of the public spaces have been re-jigged to enable the cruise line to make better use of them. Starbucks has now moved to the Boardwalk meaning the shore excursions desk can fill its old space on Royal Promenade. Another borrowed element is the décor. Understandably the construction process masks the exact design of the ship, but it was still clear that the decoration used on the Quantum-class ships had been the inspiration here. The modern colour scheme of rich dark blues and greyed browns will help give the ship a light and airy feel. The ship boasts 33cm in extra length compared to her sisters and nearly a metre in extra width. 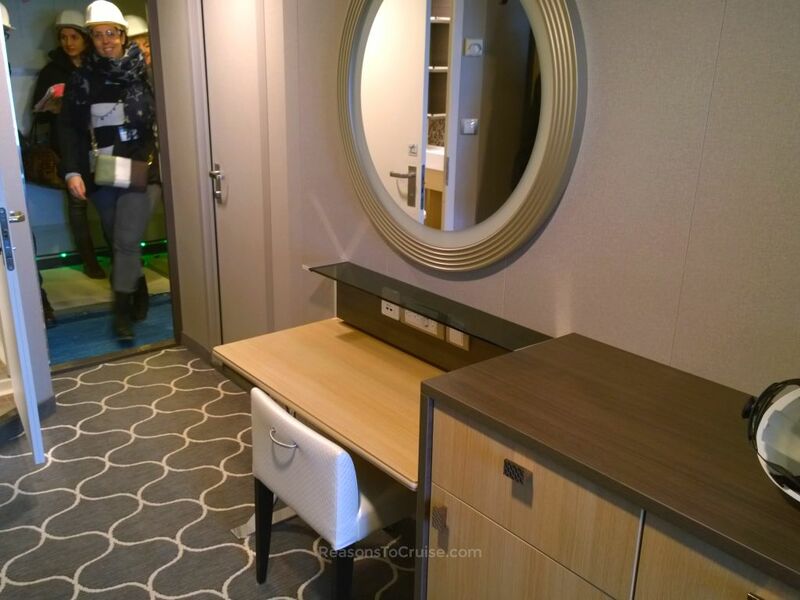 Most cabins, therefore, benefit from a longer shape but do not feel particularly spacious, especially when you cram a group of 20 journalists inside! For a typical family, the extra space should be noticeable. 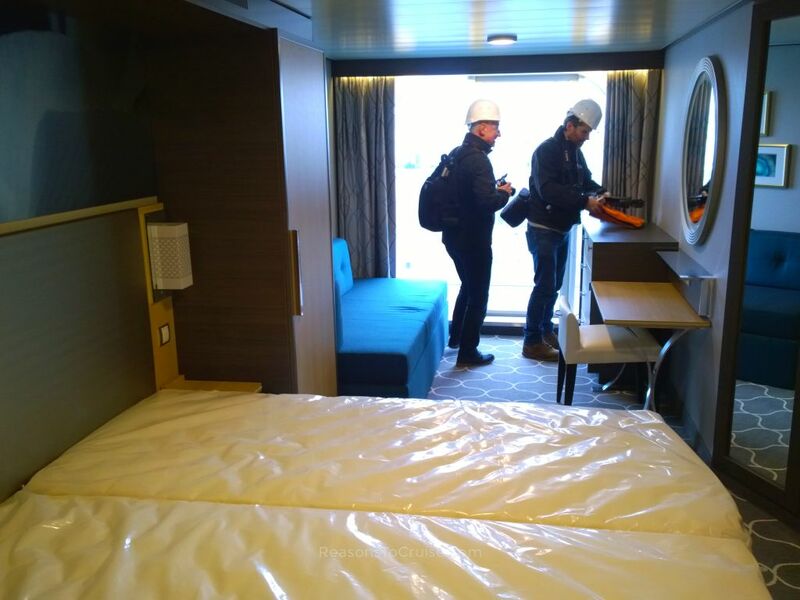 All cabins, bar some of the suites, are prefabricated off-site and then installed on the ship. They have been designed to maximise the amount of usable space. In a standard ocean view balcony cabin, flat screen televisions sit at the foot of the bed, and a sofa sits alongside the bed, framed by tall cupboards. Across from the sofa is a desk (with plug sockets and two USB charging outlets) sit next to an under-counter desk. The bed has been raised to facilitate under-bed storage, meaning most suitcases can fit underneath. The bathroom is relatively compact but perfectly functional. The spacious balcony is glass-fronted with a minimal rail so as not to impede on the views from the cabin. 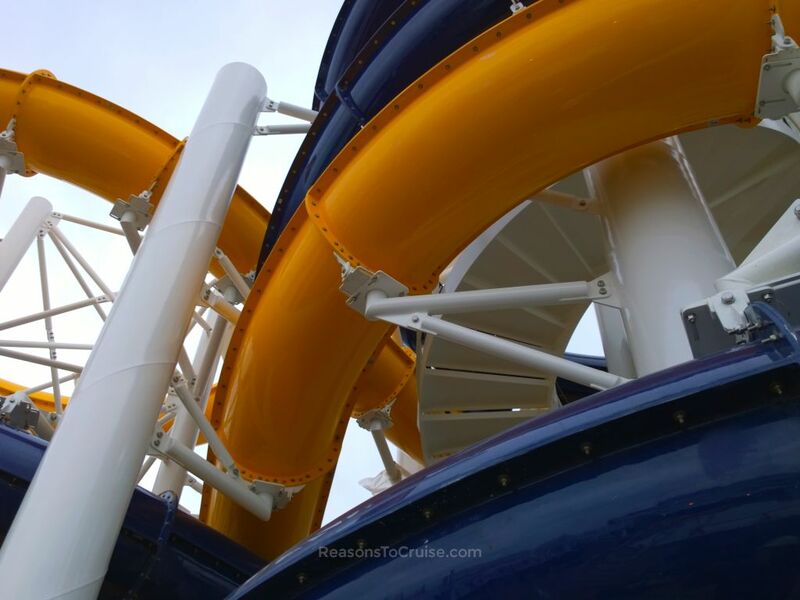 One of the biggest talking points of the ship is the Ultimate Abyss dry-slide. Work on installing the 10-storey slide on the ship had yet to commence, although construction off-site in Germany had begun. 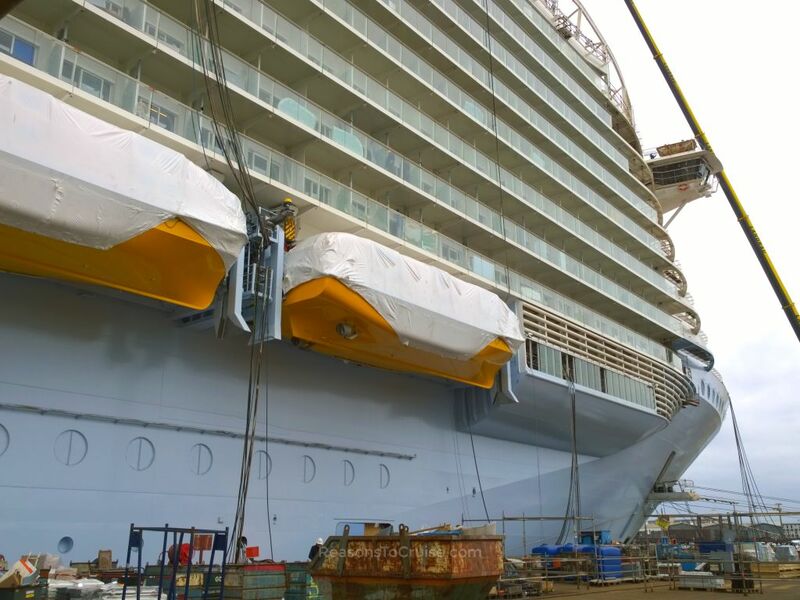 It is due for installation "within the next few weeks" according to the cruise line. The starting point for the ride was marked with a temporary scaffolding barrier. If you want to see what this angler fish-themed ride will look like, take a look at the video on Dave Monk's site. Riders will need to step through the toothy jaws of this scary-looking fish and onto a glass-floored platform before riding the ten storeys. Contractors are installing the Perfect Storm water slides at the moment. The Cyclone and Typhoon water slides are almost complete while Supercell still has a way to go. 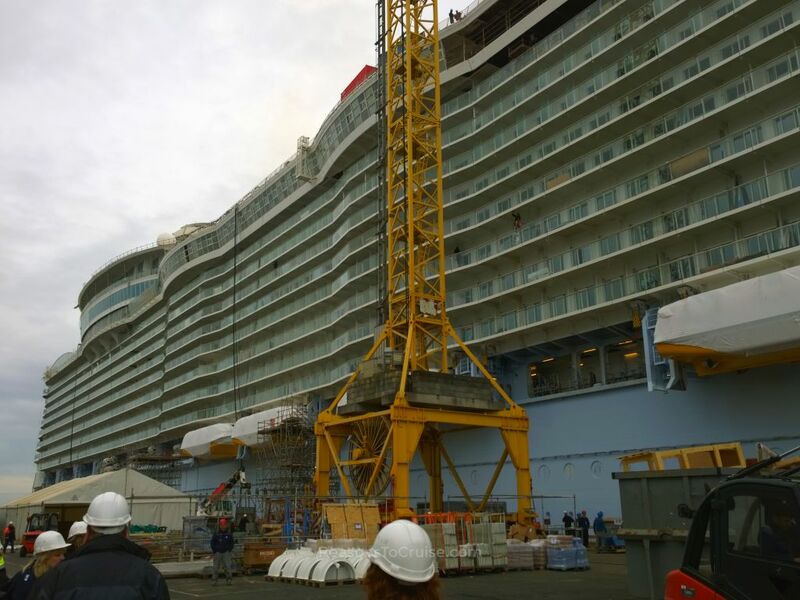 Overall, as a cruise ship geek, it was great seeing the ship in a state of construction. Only a lucky few ever get to experience seeing a ship before the final layer of pizzazz is added. 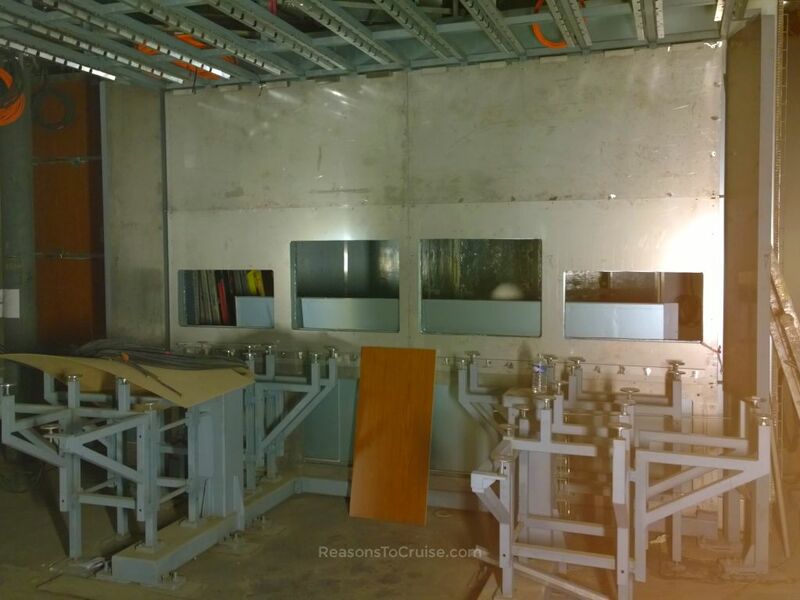 For a cruise ship fan, there is something quite special about seeing the raw product - the steel frame peeking from behind framing; the rough surfaces and decoration; the army of workers fitting out the ship ready for its finishing touches. In just three months, the project is due for completion, and the building blocks will have been stacked to form something remarkably special. Harmony of the Seas will be known as the world's biggest cruise ship, and I think she will represent the best of Royal Caribbean. Merging the essences of the massive ships of the Oasis-class with the technological innovations found on the Quantum-class will lead to a passenger experience truly unlike any other. 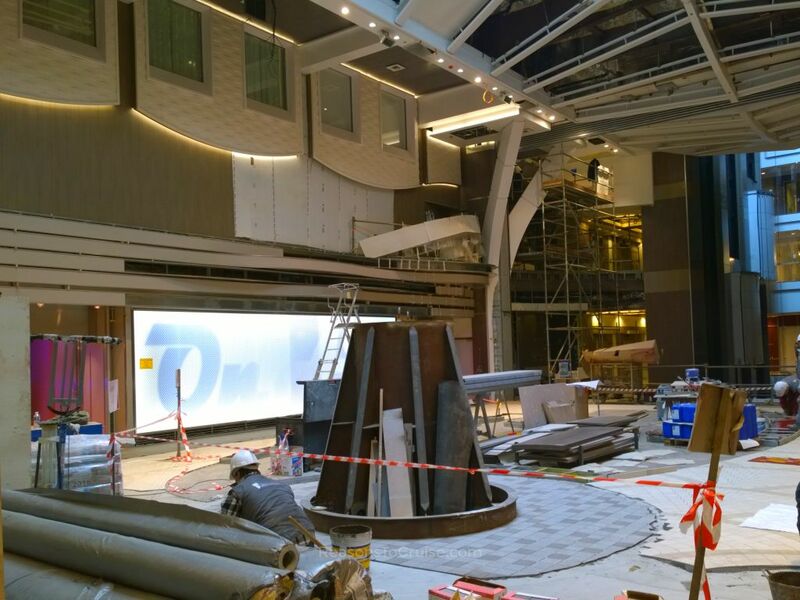 What are you most looking forward to on Harmony of the Seas? Leave a comment below. 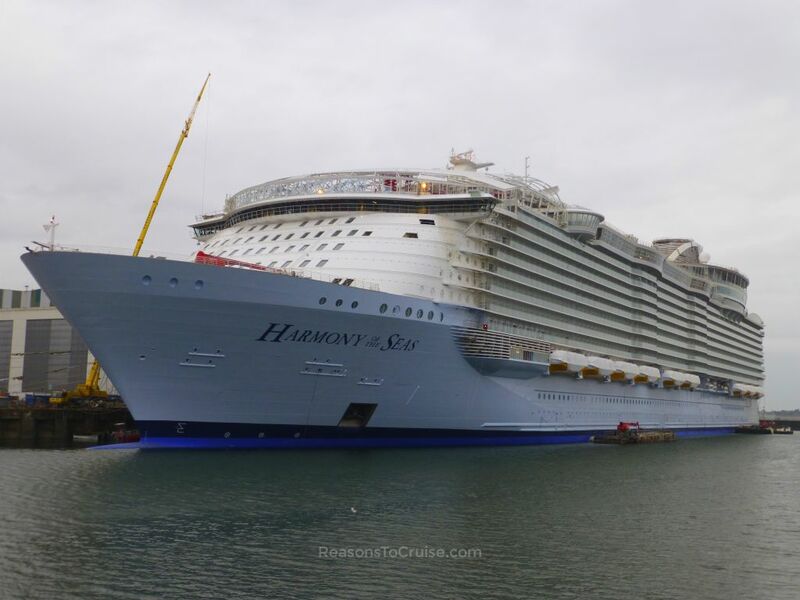 UPDATE: Read my Harmony of the Seas review here. Disclosure: This trip was arranged by Royal Caribbean. I paid for my travel to and from London Gatwick Airport. My opinions are my own.